Buehler Challenger & Science Center provides an unforgettable experience for both children and adults. Fly a variety of different space missions in our simulator and enjoy our unique hands on experience to learn more about science and space exploration. We look forward to flying with you! 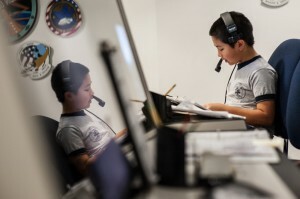 Check out some of the ways you can get involved at the Challenger Center! Contact us to become a donor, "Buy a Brick", or volunteer. An exciting way for scout troops to learn about the wonders of science and space exploration. Scout missions will also help scouts work towards badge and patch requirements. Fly space missions beyond your wildest dreams! "An educational treasure trove! I've had my curiosity peaked... exactly the reaction I always hope my students have!" "An exhilarating way to experience and explore the Universe without leaving the classroom!"